The first Friday of every month is eagerly awaited by financial markets, not for religious reasons, but because the USA releases its unemployment report on that day. Why is this so important? Why do US interest rates matter so much to us and the rest of the world and what impact do they have on Singapore? To find out, let us see if there is really a link between the interest rates of the USA and Singapore. 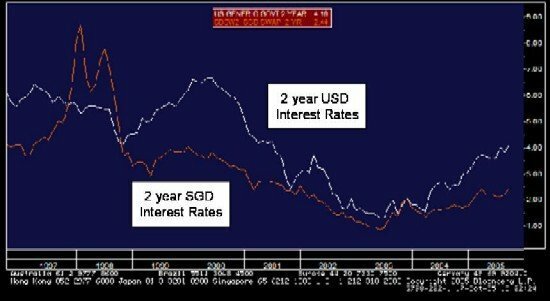 The chart below shows the US dollar (USD) and the Singapore dollar (SGD) two-year interest rates from 1996 to 2005. Except for the period of the Asian financial crisis of 1997/98, one can see a close relationship in terms of movement between interest rates of both currencies. #1 This has to do with how Singapore manages monetary policy domestically. To begin, Singapore does not have an overt interest rate policy. It does manage the value of the SGD against a basket of currencies that belong to its major trading partners. In a country that has its currency pegged directly to the USD, its interest rates must rise and fall in tandem with those in the US. One example of this is the Hong Kong dollar. The disaster that befell many of the Asian countries during the crisis of 1997/98 can be traced directly to the fact that all these countries had their currencies pegged, in one way or another, against the USD while allowing their own domestic interest rates to rise much higher than USD interest rates. But this is another story. By managing the SGD against a basket of currencies (of which the US dollar is a primary component due to trade), Singapore has also allowed SGD interest rates to be influenced almost directly by the interest rates of the currencies in the basket. Hence, when USD interest rates rise, SGD interest rates must also rise. This rise may not be lockstep (although the chart above shows fairly strong correlation) nor does it have to be of the same magnitude. It has also been said that the US has become central banker to the rest of the world. It isn’t just Singaporeans who look anxiously towards the Federal Open Market Committee (or FOMC) each time they meet, but also most of the free trading capitalist world. The FOMC is the policy body in the USA that sets the level of interest rates, and hence the price of money. Each FOMC meeting is watched carefully by markets all over the globe. Again the question, why is this so, has to be answered. This leads to the second reason why SGD interest rates are so closely linked to USD interest rates. The USD is recognised as the leading trade currency in the world today. It also forms the largest pool of freely available capital on a global basis. This means that the USD is the most easily borrowed and lent currency in the world. USD time deposit accounts can be set up even in banks in Singapore. As a result, international borrowers typically turn to the USD for most of their borrowing needs. The USD is then sold in the FX markets for the currency that the borrowers require. At the end of the loan period, the currency is then re-sold back in the FX markets for USD. Let’s take a simplistic example. If USD and SGD 3 month interest rates are exactly the same at 3 per cent and if the USD/SGD foreign exchange rate is pegged at S$1.7000, then there isn’t any reason for someone in Singapore to borrow USD and change it to SGD. Why? Because there is nothing to be gained or saved between the interest rates, meaning you can borrow in either USD or SGD and still pay the same 3 per cent. However, if USD interest rate fell to 1 per cent, the picture changes dramatically. Someone in Singapore who needs funds can now borrow USD for 3 months at 1 per cent, sell the USD for SGD and at the end of the 3-month period sell the SGD for USD to repay his creditor. His borrowing costs have now dropped to 1 per cent compared to if he had borrowed directly in SGD at 3 per cent. Likewise, smart investors will recognise that there is a money making opportunity here. The same flow takes place except that the investor takes the SGD he receives from selling the USD, and lends it out at 3 per cent for 3 months to gain 2 per cent. After a while, as more and more investors take advantage of this trade, the 3 month SGD interest rate will no longer stay at 3 per cent but will have to fall to 1 per cent as well until no more money making opportunity exists. Thus, as USD interest rates fall or rise, so too will SGD interest rates. As we said earlier, this is a simplistic example as it precludes floating foreign exchange rates. 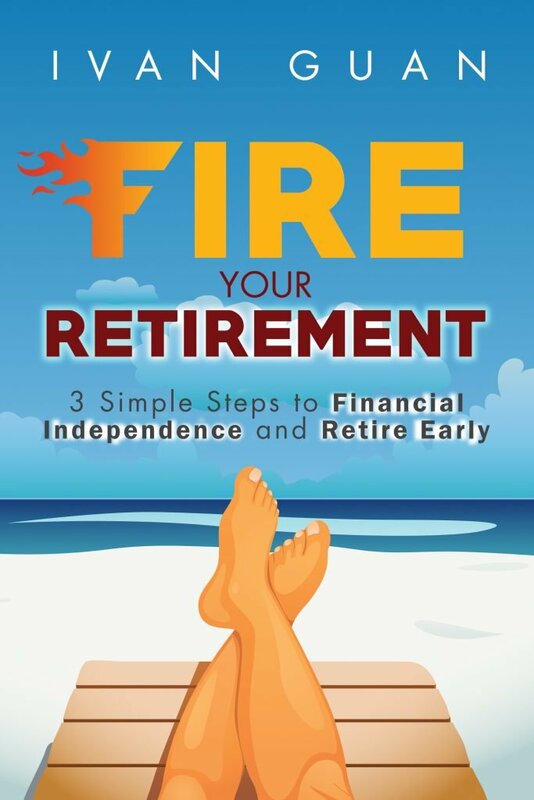 However, it illustrates what goes on in the financial markets everyday. So there you have it. This is the reason why financial markets hold their breath when the USA releases key economic reports, or when the FOMC meets. And these are the reasons why, SGD interest rates are tied closely to USD interest rates.